I am sure everyone is so eager to wait for Budget presented every year. Last friday, our Prime Minister, Datuk Seri Najib Razak, disclosed the plans for the Warisan Merdeka project, a new Kuala Lumpur landmark, in the Budget 2011. This mega tower building, named ‘Warisan Merdeka’ or ‘Heritage of Independence’, would be the tallest in Malaysia, dwarfing the iconic Petronas Twin Towers, which were the world’s tallest buildings at 88 storeys when completed in 1998. Construction of the 100-storey tower skyscraper, which is part of the RM5bil mega project within the enclave of Merdeka Stadium and Stadium Negara in Kuala Lumpur, would begin sometime next year and is expected to be completed in 2015. The 19-acre development area of the mega project — which includes a condominium and a shopping mall — is sited on the car park and land adjacent to Stadium Negara and Stadium Merdeka. Najib has said such projects exemplify the spirit of “Malaysia Boleh” or “Malaysia Can”, a national campaign conceived by former premier Mahathir Mohamad, an advocate of mega projects. It has come under a very heavy criticism from the opposition as well as the general public. 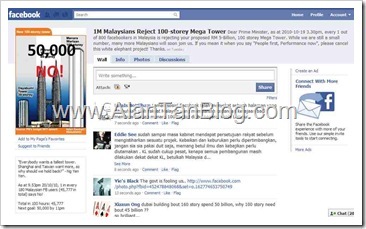 This is clearly shown in a Social networking site Facebook page called 1M Malaysians Reject 100-storey Mega Tower. It have more than 45 million people who say NO this wasteful white elephant project. 1) What is the main purpose to build this Mega Tower when there was an existing property glut? 2) Why do we need another landmark near the Petronas Twin Tower? 3) How many actual landmarks do we need? 4) Do really need for yet another super skyscraper, despite already having the iconic Petronas Twin Towers? 5) What is the demand and supply of office space in the capital city now? 6) How does the Permodalan Nasional Berhad (PNB) going to pay for this mega project? 7) Has a proper feasibility studies done? 8) How does those CONTRACTS help our economy? 9) How many local retailers can afford to rent a retail space in the complex? I hope the government can spend wisely and remember not to spend recklessly even have money! A few months ago, some Minister said that the country will be going bankrupt if subsidies are not withdrawn…. so this is why the subsidies were withdrawn… to build another “Mega White Elephant “ project? What the city needs badly is a first-class transport system NOT a warisan tower! They said that the building will not improve Kuala Lumpur’s international standing but will exacerbate the traffic congestion in the area. Will mega-tower affect ASN dividends? An opposition parliamentarian has raised doubts on the ability of Permodalan Nasional Berhad (PNB) to build the 100-storey Warisan Merdeka skyscraper, hinting at the possibility of lower dividends from its unit trust schemes. This entry was posted on Friday, October 22nd, 2010 at 7:18 am	and is filed under Tips. You can follow any responses to this entry through the RSS 2.0 feed. Both comments and pings are currently closed. IT’S common during times of economic slack for the Government to push for projects to get activity up to provide jobs and incomes for people. It was economist John Maynard Keynes, who is now fashionable again, who famously said that the economy would be better off during a depression if all workers did was to dig up ditches and fill them up again. Sometimes, governments tend to take that statement too literally forgetting that for small open economies it is not possible to print money without disastrous consequences on the currency rate, inflation and investment. Keynes’ statement must be taken with a pinch of salt given that there is a limited amount of government resources that can be put into stimulus packages. The most has to be obtained from the limited amount the Government ploughs into these projects. Each ringgit must count and the leakage in terms of both over-pricing as well as foreign sourcing of goods and services must be limited as much as possible so that maximum benefits accrue to local industry and enterprise and creates jobs for Malaysians. It is not always easy to do that. Take the mass rapid transit system (MRT) for instance. At an estimated cost of RM40bil, it’s a very massive project, even if it is undertaken over 10 years with all the potential for costs to increase the further out into the future it goes. That it will have major benefits in terms of moving people around and in Kuala Lumpur and the vicinity, reducing traffic congestion, enhancing the quality of life, etc, cannot be denied. But if it is not properly planned, designed and executed it could become a major disaster and fall far short of the expectations. Economically, there will be plenty of leakage from this project. Trains and tracks will be ordered from overseas and could account for 30% or more of the cost. Tunnelling will be highly automated and use a lot of expensive equipment sourced from outside the country. Labour is likely to be largely foreign as well as expertise. The rest of the remaining costs are likely to be for acquisition of land and other civil works. The latter has little impact on economic growth. Thus, while the RM40bil figure is huge, the final contribution to the economy in terms of production of goods and services will be smaller than expected even if we take into account the multiplier effect. This theorises that spending of a sum in the economy enlarges the economy by more than the amount spent. But if there is high leakage of project costs to outside the country, that’s not going to happen. It is imperative that much more thought is given to the project. There is no hurry to get it off the ground – or under the ground in this case! – given the huge capital expenditure involved. Considering that nowhere in the world is an MRT profitable, we must expect that the Government will in one way or another bear this burden. Meantime, authorities should focus on other ways to get traffic down during rush hour. Car-pooling will work if there is incentive and punishment to get it going. You need to have a surcharge on cars going into congested areas for instance and for existing public transport to improve. Ditto for the rapid train to Singapore. If you can open Subang airport to flights to Singapore in a big way and allow boarding 15 minutes before departure for passengers without check-in baggage, you can get people to Singapore in an hour or so. That will be quite comparable with a rapid train – without all that expense, last estimated at a whopping RM8bil. Finally, all that hooha over Permodalan Nasional Bhd’s (PNB) RM5 billion plan to put up a 100-story tower between Merdeka Stadium and Stadium Negara seems a bit overplayed considering the project will span 10 years. But what is worrisome is the question of why the tower needs 100 storeys, to be built at much greater expense per square foot. Is it really true that you need such height to attract interest? There are examples of many projects around the world much shorter than that but which are considered to be of high quality and which attract plenty of interest. PNB should be more forthcoming with what it plans to do and how it will make it something the nation can be proud of with – and this is important – minimal cost. ● Managing editor P Gunasegaram does not like the word “iconic”. It does not say much but conveys unambiguously one important message – expensive. “We are studying the terms in order to fulfil them. We must ensure proper planning because the development order is approved with conditions,” he said after announcing the income distribution for Amanah Saham Wawasan 2020 for the year ended August 31 2012, here, yesterday. The tower – touted to be the country’s tallest – will cost RM2.5 billion to RM3 billion and will have gross floor space of three million sq ft and net floor space of 2.2 million sq ft. It is scheduled to be completed in 2015. “Four companies have already been divested so far. We hope everything will be settled by the first half of next year,” he added.